As of December 1st, we are well into the Christmas season. Time to decorate! Before you bust out the glitter and Popsicle sticks, lets take a moment to consider some alternative ways of creating a festive atmosphere that is both cheerful and classy. While DIY decorations are a fun and personal way to vamp up your home, there are some tricks to stretching what you already have (you know, that massive box of ornaments and burnt-out string lights in the attic) by adding a few key pieces from your yard…or your neighbor’s yard. If you’re lucky enough to have a collection of festive antiques–figurines, canisters, pitchers, etc.–then bring them out and pair them with pine cones, sprigs of holly or evergreen branches, bunches of cranberries (or any faux berry), feathers, and one of my personal favorites–magnolia leaves. Bringing natural elements indoors is one of the easiest ways to create a classic Christmas look. Gold and brown can be just as Christmasy as red and green if you use the right shades and accents. 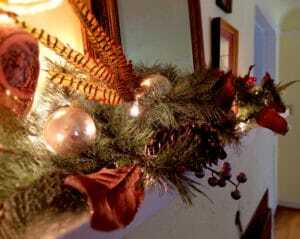 We paired magnolia leaves and pine cones with a wintery evergreen garland for the mantel. Some brown striped pheasant feathers really help set this mantle apart and make the look our own. By working with the existing pieces on the mantel–a dusty-rose colored lamp and golden-brown framed mirror–we were able to create a look that enhances what we already have, rather than fighting against it. This is the most important part of creating a look that is elegant and festive: work with what you have, then embellish. The backdrop for this display is AS09SP— a soft springtime yellow. Next time we’ll show you what we did to transform the rest of the house and a creative use for pomegranates. Hint: it’s not juice. Have some milk glass lying around? Throw that in as well. You’re easygoing, comfortable, enjoying life’s simple pleasures. This understated palette offers the ideal hint of color to make you feel right at home. Choose slightly deeper tones for your fabrics and keep that softness going with plenty of texture. Earlier this summer we did a “His & Hers” double bathroom remodel and this palette was the perfect bridge for the gap in their unique styles. Try this palette with rich wood and dark fixtures to bring some drama. Click the photos below to see more from this project. A warm, rich brown sets the tone for this Summer Palette. Try the AS07S for your walls or ceiling, and the AS05S as your trim or door color. You’re comfortable in your own skin, expressing your personal style no matter what the trends say. The true-to-nature shades in this bold palette play up your strengths. When choosing fabrics, try mixing in a touch of teal to make it all pop! Our home remodel project in North Bend utilized a chocolate brown and sandy gold from this palette. For the bathroom, we went all-in with spa style. Pebble tile, a walk-in shower, a rustic chandelier, and tons of natural light from new doors and windows. We continued this palette into the adjacent master bedroom, adding a bold pop of red in the form of throw pillows. Over in St. Paul, Oregon, my lovely niece is updating her 1920’s classic bungalow/cottage. Originally owned by her grandmother, this home has beautiful old bones. As a mother of four living in the town famous for Rodeos, she and her husband love to entertain. An unfortunate drawback to living in an older home, however, is an outdated layout. All of the bathrooms are on the main floor, and all of the bedrooms are upstairs. The solution is not only a remodel, but a full-on addition in the form of a dormer with new windows. Her vaulted ceilings were leaving some unused space that was perfect for adding a small master bathroom and walk-in closet. We added a dormer to accommodate head-height and bring in lots of natural light for their his and hers bathroom. For the bathroom walls, our soft gray from the Winter Subtle collection was the perfect soothing contrast to the cheery yellow in her bedroom. Because this bathroom didn’t exist before, we had to re-rout the plumbing starting in the foundation, working our way through a main floor bathroom, and finally into the upstairs. 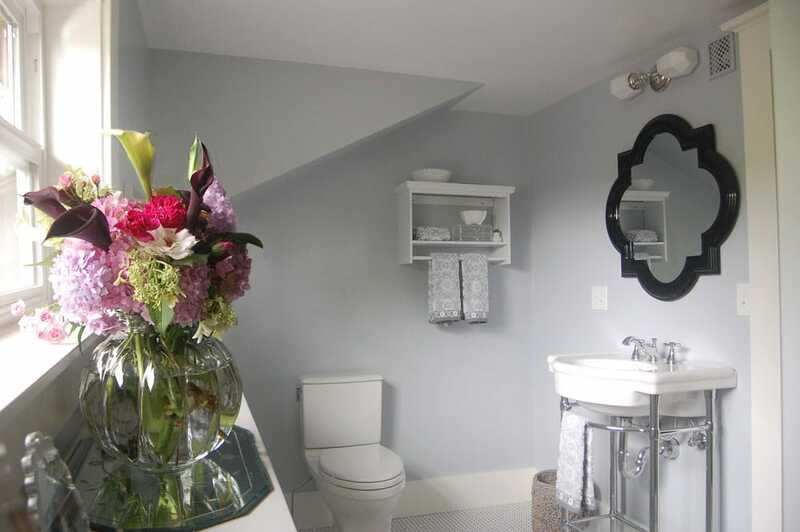 By creating a master suite upstairs, this frees up the main floor bathroom to be used by guests, just in time for one of her St. Paul Rodeo parties. The best part about this remodel is that I get to work with my very talented niece. She has an amazing eye for color and design and has worked for Allison Smith Design in the past. This project felt more like a collaboration; bringing her personality and style into the final product made it all the more personal and successful. She and her large family–husband and 4 children between the ages of 3-16–have received a much needed addition to their home that they can enjoy for years to come. For the rest of the upstairs, head over to the new Portfolio Gallery. An upscale design for an industrial setting. Having worked in China previously on a western-themed resort community, Jackson Hole, I already had a feeling for how to work through the language barrier. When working on new construction in the States we’re able to focus on the details and oversee the implementation of our designs in person. When sending a design to China, you never know. Choosing the materials is the fun part where we get to work out how the project is going to feel; what kind of vibe it’s going to give off. Our contact in Shanghai, Andy, provided us with photos of the bare bones of this large apartment building so that we could create a plan. Our job is to create an inviting apartment that will appeal to the expatriates, some of them from the States, who are living and working in Shanghai. This model unit needs to show the potential of the building and draw in new occupants. It really has to shine. Using only these photos, AutoCAD plans, and a little help from our friend Andy, we were able to come up with a design theme: Post-Industrial Posh. Walnut flooring set in a chevron pattern, Carrara marble tile, black and white paint, exposed concrete and some painted brick round out our design board. Because we cant be there in person, we decided to create a 67 page instruction manual for implementing our design. This may seem like overkill, but flying to Shanghai every time there is a question about flooring installation just isn’t an option. To get it just right, we have to be specific. We started with the floor plan layout. This building has 4 apartments per floor, and 12 floors. We only have to design the model unit, which is on the southern corner of the fourth floor. The only obstacle at this point is working within the existing structure; the developer would like a three bedroom, two bathroom unit. Fitting all three bedrooms into this space while maneuvering around support beams, fire doors, and concrete columns, is a challenge, but nothing we cant handle. We opted for an open-concept living space that takes advantage of that large wall of windows. Even though furniture wont be specified, the best way to get a feel for how the space works was to throw in some generic furniture outlines. The ceilings in this unit are relatively high but there is a sprinkler system and concrete support beams are scattered throughout. To give the apartment a clean look while keeping our post-industrial theme alive, the solution is a dropped ceiling in some areas, and exposed beams in others. In the living room and bedrooms, the ceiling will be at it’s full height–about 11 feet–for the bathrooms, foyer, hallways, and above the closets we’ve decided to drop it down to 9 feet so that we can add recessed can lighting. To make sure they understand the look we’re going for, we threw in this rendering(on the left), drawn on top of the actual photograph of the living area of the apartment. Once the brick is up and painted, they can install the custom cabinetry we designed for this space(right image): shelves on either side for coffee table books, and cabinets in the middle to hide your components and wiring. These cabinets will have the same finish as the kitchen–a medium-tone reclaimed look with satin black cup pulls. The rooms that have raised ceilings still needed some lighting, so we added soffits with recessed cans. The lighting schedule is very simple for this apartment, with the most ornate fixture above the kitchen island. The bathrooms get a little extra love in the form of sconces around the mirrors. Our in-house graphic renderer was able to put her new skills to the test with this project. Bathed head to toe in marble, we needed to show the tile layout for both the master bathroom and the second bathroom. Even though the images are just rough digital sketches of how the rooms will look, we feel they get the point across. 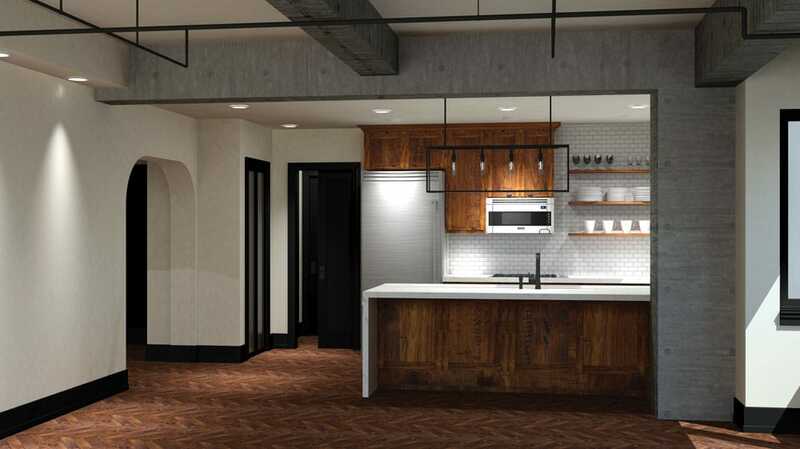 For the final renderings of this apartment, we opted to hire a professional to ensure that we can provide top-of-the line detailing with the representations of our design. Any point where the language barrier cant be broken down, these images have to pick up the slack and explain our intentions. We were so happy with how they turned out; they almost look like photographs! Hopefully, once the apartment is finished, our friend Andy will send us some pictures. For now, we just have to hope that they love our design as much as we do and can create this beautiful apartment.